Our controls maintain precise feed rates under varying loads and fluctuating line voltages. Optional modular panels include a timer panel to compensate for input signal variances and a color/regrind panel to automatically adjust colorant feed rate when regrind is present. 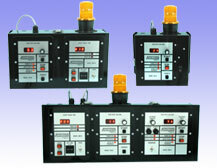 We also offer a four panel unit which can control three feeders with one timer panel.